A great conversation on TTWWADI is brewing between the comments left on my last post and Clarence Fisher adding to the conversation on his own blog. The more this conversation emerges the more I’m convinced that an embedded technology approach is a great approach to use in schools. What was important in this case was not the coding and the software skills, although they did come into play. What was important was the information presentation skills, the design and interplay of colours, fonts, organization, etc. So as a classroom teacher he’s concerned about information and presentation skills. As a technology person I’m interested in coding, layout, color, and presentation skills. Our interests are the same, but our focus is different. Clarence has good technology skills, I would say above average compared to most teachers and probably doesn’t need a technology person helping him teach these skills to his students. But for the teachers that are focused on information and presentation but don’t have the knowledge of web design, a technology person there to help is critical. This is why I like the term embedded technology rather than integrated technology. Integrated to me seems like we’re putting it on top of what we’re doing when really the technology part is embedded as part of the assignment. It’s like a hamburger: A patty is far better when presented with lettuce, tomato, ketchup, mustard, and relish (substitute your favorite toppings here! 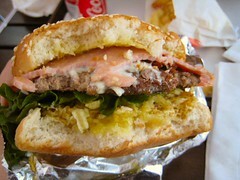 FYI a good burger is something I can’t wait to have when I get back to the States in a couple weeks.) between the buns not on the side as add ons. In order for an embedded technology program to work you have to have two key factors in place. 1) A classroom teacher who is willing to open their door, team plan/teach, and understands the skills needed to complete the project. 2) An educational technology person how understands teaching and learning, understands the standard or outcome the classroom teacher is trying to meet with the project and can team plan/teach lessons. There are teachers out there like Clarence who are a 2 for 1 package and can do both. I can’t wait until all teachers are at that level and I no longer have a job. I’m waiting for the day that a principal comes to me and says, “Jeff, I’m sorry but our staff doesn’t need you anymore.” As strange as that sounds…it brings a smile to my face. Moving to an embedded technology model allows us to teach 21st century skills within our content areas. Both are more meaningful and engaging to the learner. Personally I’m looking forward to next year where my full duty will be to help teachers embed technology into everyday content. Next year Dreamweaver might be more relevant to me and my students as there will be a purpose for us to use the program other than me teaching it because TTWWADI. I don’t think you will ever be out of a job, but I love the fact that you are willing to help teachers use technology in their classrooms. I have actually had instructors get mad at me because I wasn’t catching on fast enough! By the way, the hamburger looks mighty tasty! Sometimes you have to use things like electronic gradebooks before you appreciate the fact that they can help you. It took me about a year to become comfortable with putting my grades on a computer. I used a paper gradebook in addition to the computer for the first two years because I was afraid I would lose all of my grades. Also, at first it was really hard to remember all of the steps. I can’t speak for all schools, but I feel that the main reason some teachers do not feel comfortable with technology is the fact that they are not given enough time to learn how to use it. It’s a “hurry hurry” presentation at an after school inservice, and then, no help when you get stuck. I have waited all day for a tech person to come to my room, push a key, look at me in a poor you way, and leave without explaining what I should do if I got stuck again. I have learned more since I retired and started blogging because I have a patient son-in-law who actually treats me like someone with a brain that can learn.